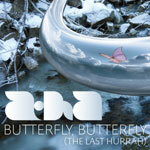 a-ha's final single release "Butterfly, Butterfly (The Last Hurrah)" (4:10) premiered on Norwegian radio on 14 June 2010. It was sold digitally in Norway from 5 July and was included on "25" a best of release out on 19 July. The single was released to German stores on 30 July and to UK stores on 20 September. The single was also available digitally in the following countries: Japan (21 July); Austria, Czech Republic, Hungary, Poland and Slovakia (30 July); Spain (27 September); Australia, Belgium, Brazil, Canada, Eastern Europe, Finland, France, Greece, Ireland, Italy, Luxembourg, Netherlands, Portugal and Sweden (TBC). It was written by Paul Waaktaar-Savoy and produced by Martin Terefe. The UK and German releases are identical. The cover artwork features a shot of the edge of a stream with snow on the ground. There is a metal ring over the water with a reflection of a pink butterfly against a cloudy sky. 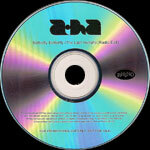 A brand new a-ha logo is printed in white at the bottom with the title in white capital letters underneath. There is a light blue strip down the left hand side of the front sleeve with the text "single CD 2 songs standard" in white. The spine is also light blue. has a light blue. The revers of the sleeve is a darker blue with the title in large white letters across the top and tracks listed at the bottom. It features the "Single Edit" (3:40) and the "Steve Osborne Version" (4:28). The disc is silver with white titles and a light blue ring in the centre. 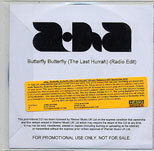 There is a UK 1-track promo of "Butterfly, Butterfly (The Last Hurrah)" which comes with a folded paper insert in a PVC wallet. The front of the insert is similar to the cover of the regular release, but without the blue strip down the left hand side. The reverse of the insert is white with the new a-ha logo in large black letters at the top and the title in black underneath. Towards the bottom of the sleeve is a red and white "Rhino" logo plus some promotional text including "For promotional use only. Not for sale.". The disc is silver with similar text and design to the back sleeve except for the "Rhino" logo which is black and positioned on the right hand side. Some copies of the UK 1-track promo come with promo stickers on the back of the PVC wallet with information about the single and album release plus contact details. "Nonstop Promotions" (black and white); "COPMED!A" (black and white) and "Hesso Media" (orange) editions are known to exist. 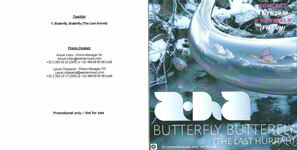 There is a 1 track Belgium promo CD of "Butterfly" which comes with a floded insert in a PVC wallet. The front cover is similar to the regular release, but the text "Concert 11/10/2010 @Brussels (FN/VN)" is printed in pink and white letters in the top right hand corner of the sleeve. The text "For promotional use only - not for sale" and the Warner logo is printed in the bottom left hand corner. The back of the sleeve is white with the tracklist, promo contact details and promotional text in black. 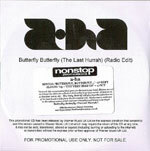 The disc has a white vinyl label with A-HA "Butterfly" printed in black at the top plus the blue Warner logo and promo text at the bottom. There is a Danish 3 track promo single which comes in a stickered PVC wallet sleeve without insert. 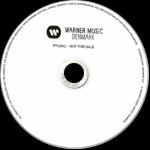 The disc is white with black text including the text "Warner Music Denmark Promo - Not for sale". The sticker is white with the title and track listing in black plus a colour shot of the single artwork underneath. It features the "Single Edit" (03:43); "Original" (04:10) and "Steve Osborne Version" (04:29).